Antilatency is a new positional tracking system for mobile VR that can simultaneously track several players in the same space over a room. I got to try it at VRLA and it was impressive! Mobile VR is currently limited to head tracking, which limits immersion. 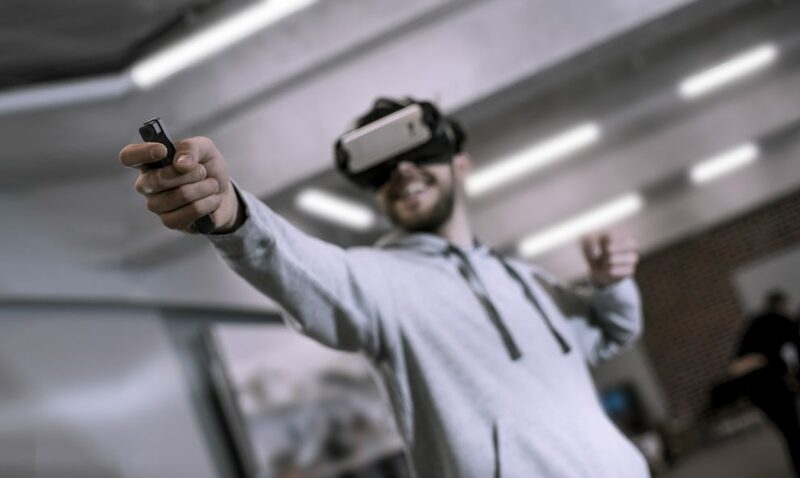 However, there are an increasing number of accessories that add positional tracking capability to mobile VR headsets. One of them is Antilatency, a positional tracking system for mobile VR that can track multiple players in an area of almost any size or shape. Antilatency consists a pinkie-sized infrared tracker called the Anti-Latency Tracker (ALT) which attaches to a headset, and strips on the floor that emit IR light. The strips are powered by any USB source. For front-facing VR, only one strip is needed. However, you can use four strips to track an area up to 10 feet by 10 feet 10 meters by 10 meters (30 feet by 30 feet), and a theoretically unlimited number of strips to track any size area of any shape. Antilatency can track multiple players in the same space, and can even track peripherals such as controllers or guns without any additional modification. Its motion controller actually consists of just a holder for the ALT. According to Antilatency, they plan to enable playing Steam VR games using RiftCat in the future. As you can see I tested different types of motion at different speeds. The Antilatency system performed very well. The tracking wasn’t as rock-solid as the HTC Vive or Oculus Rift, because there was sometimes a slight lag when changing directions, but it was not distracting, and it did not feel uncomfortable or nauseating. It felt better than any of the other mobile VR positional tracking systems I tried (or indeed, some desktop VR headsets) and was the mobile VR system that felt most similar to the Rift or Vive system in terms of tracking fidelity. Antilatency will be crowdfunded for $99, which will include one strip. However, there will be a package that includes four strips for roomscale VR and a package with controllers. They are planning to begin the crowdfunding around August, but the date is not definite yet. Here is their official website, and here is their Facebook page. Robo Recall for Oculus Quest: first screenshots posted!